In our house, sometimes the lifetime of a recipe is short lived. I’ll try out something new, make it a few times until it is perfected, then photograph it to post and memorialize the recipe on the blog forever. After that it will rarely make it back into the rotation since I’m too focused on trying to create and discover new and exciting recipes. This salmon with dill butter on the other hand? This recipe is seared up in a pan, plopped with compound butter and quickly devoured a few times a month. This salmon with dill butter has a lot going for it. First of all, it’s healthy so I can cook it often and eat it guilt free. Great for this “pre-bikini season” time of year when carbs are no longer my best friend but now my sworn enemy. I’m looking at you pasta! 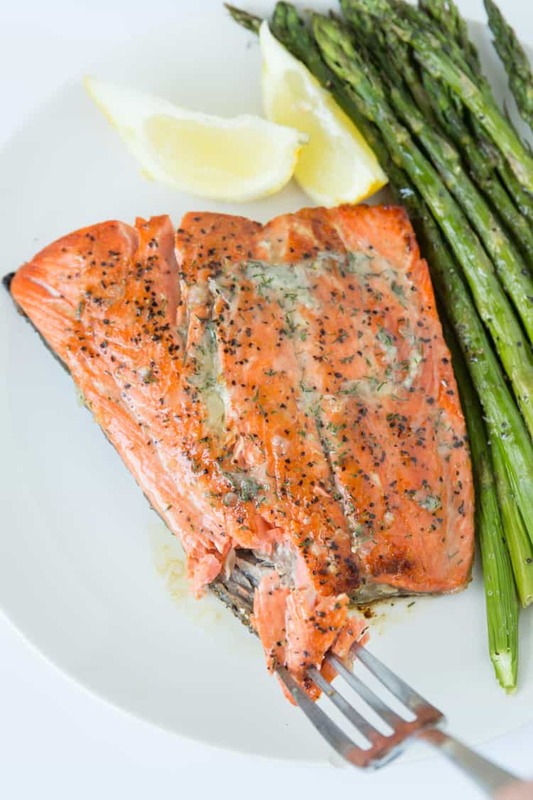 This salmon with dill butter has a whopping zero carbs and almost 70 grams of protein. Me likey those numbers. This salmon with dill butter is a lifesaver on busy nights because it comes together in 15 minutes or less. Seriously! And that includes time to cook up some veggies on the side. I of course love salmon served with asparagus. This might be the most flavorful 15 minute meal in my repertoire. This is all thanks to the melty and delicious dill butter. You just whip up some room temperature butter, dried dill, garlic and a little lemon zest. Takes this salmon from good to great in seconds. Oh butter, you make everything better. Preheat a medium size skillet over medium high heat. Salt and pepper the salmon filets. Dill Butter: Combine the butter, dill, garlic and lemon zest in a small bowl. Stir to combine. Set aside. Pan Seared Salmon: In the preheated skillet, add the olive oil and cook the salmon (skin side up if it has skin) for 4-5 minutes on the first side, then flip it and cook another 4-5 minutes. The cook time will depend on the size and thickness of your salmon. You want the inside of the salmon to start to turn opaque and reach 135 degrees. 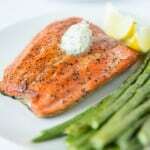 After the salmon is cooked, remove from heat and top with 1 tablespoon of the dill butter. Serve immediately. Leftovers will keep refrigerated in an airtight container for 5 days. Oh, gosh, Natalie. I am drooling all over the place here. Is it really weird of me that I’m craving salmon at only 7:30 am?? I’m loving the beautiful sear on this salmon and I’m OBSESSING over how amazing that dill butter looks. I’m just planted dill in our garden and I’m thinking most of it is gonna be going into my butter from now on. *wink*. Pinned! I LOVE these kind of easy and healthy recipes! Packed with flavor and nutrients, but so quick and easy to make! Yum. Hi Natalie, I just love meals like this, they are the best. Simple, fast and healthy! I love that you use dried dill…I never have it on hand when I want it! I make salmon a couple time a month as well, but never with a delicious sounding butter! mmm. I feel the same about classic dessert recipes…i’m trying new ones too often to make the classics! Flavored butter does NOT get enough attention! I know I always love your stuff (duh!) but this one is a winner in more ways than one. First off the dill butter. Second the fact its done in 15 min. and Third the nutrition factor…heyo protein meal!! Just had salmon last week, and will probably do it this way next time ;) I wonder how it would work on the grill? Probably well! Thanks Natalie! Hope you have a good day! I too rarely re-make recipes but our very favorites. 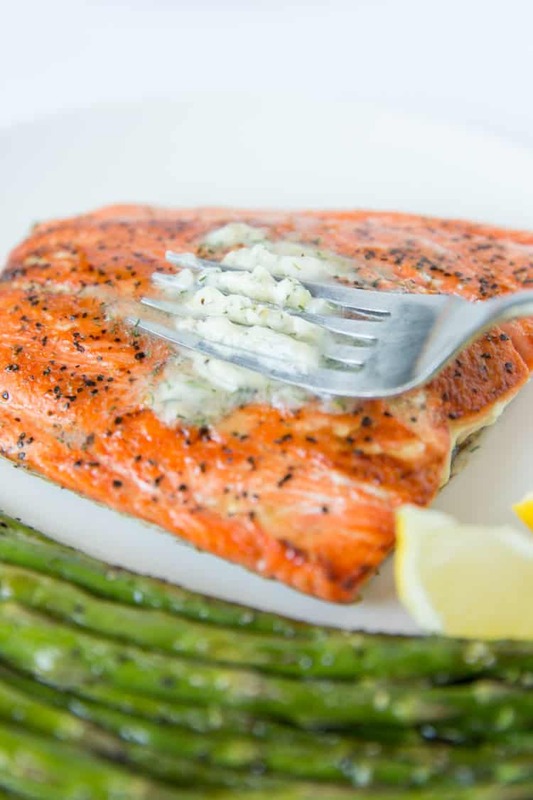 This salmon/dill butter would be a regular at our house – FOR SURE! It looks perfectly cooked and delicious. Salmon is something I love, but definitely don’t eat enough of. 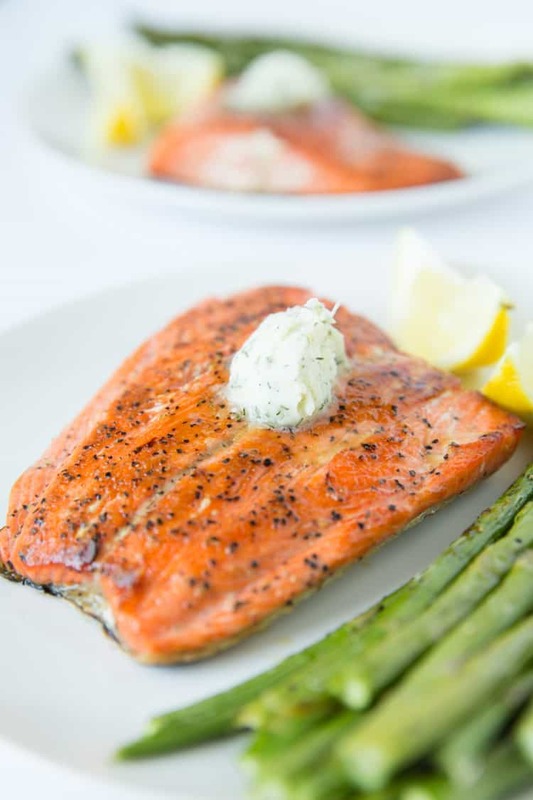 One of my favorite salmon recipes has a really delicious mustard and dill marinade so I know that I would LOVE this salmon recipe! 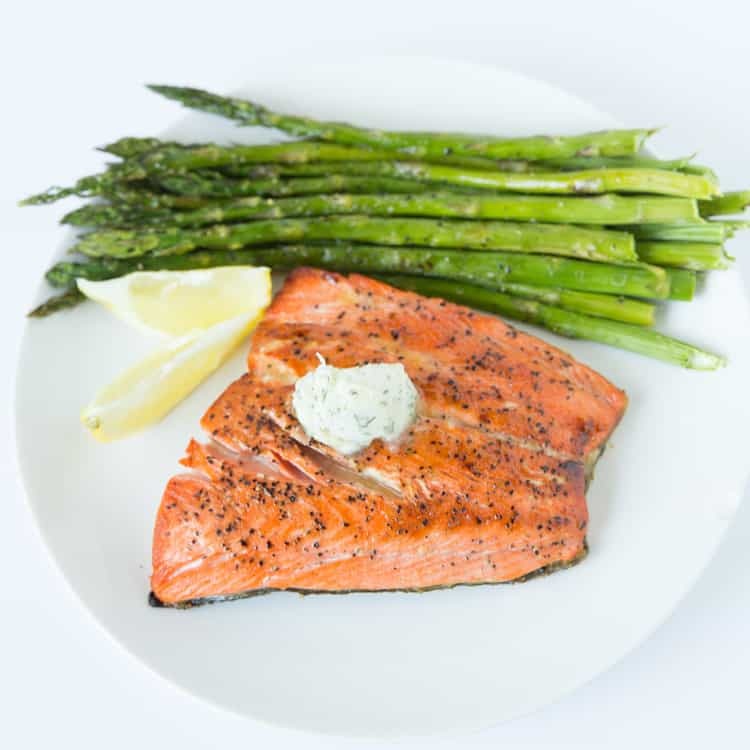 I can see why you guys eat it a few times a month :) Salmon and asparagus sound like the perfect dinner, especially because in Arizona, bikini season has already arrived! Gorgeous photos, Natalie! I love that this is so easy, yet packed with flavor, butter does make everything better. I make salmon often, but have never added a compound butter. I love this simple idea and can’t wait to mix things up by giving it a try! Beautiful photos as always! Yum, Natalie. This looks so good and I’m not even a fish lover, ha. It’s been my new year’s resolution to learn to like fish by the end of this year. Salmon is actually the one fish I’ve been really wanting to make :). 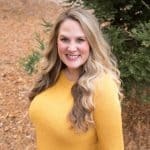 I will definitely save your recipe – I am all about tried and true recipes, especially when it comes to fish!! Totally making this since I recently started liking salmon. Oh that dill butter! i eat salmon every week. the dill butter sounds like a good idea! Living in Seattle we eat a whole lot of Salmon and I never get tired of it. This just looks perfectly prepared and lovely! Your pics are great as usual – in fact I clicked to your site from Foodgawker because it caught my eye! Nicely done! Beautiful salmon pics! Looks like a really nice recipe too. I rarely pan sear salmon…looks like I better give it a try! Thanks Sarah! I’m kind of into the whole white-on-white look of these pictures. Was fun switching up my backgrounds a bit. And a super easy recipe! I can seriously have this on the table in 15 minutes or less. Love recipes like that! Love easy recipes like this. Great clicks. Me likey this too, Natalie! Salmon is definitely one of my favourite foods, and you’re right, the fact that it’s so easy to cook just adds to the attraction. I had fish at a restaurant last night that was served with a lemon butter and it was delicious, so for sure I’ll give this a go next time I get some salmon. This looks amazing! I love that you use dried dill– I hate buying a big bunch of fresh only to use a tiny bit of it. My in-laws salmon fish in Alaska every year so we always have tons of salmon around… I’ll definitely have to try this! I love pan seared salmon- and that dill butter sounds so good! I need to eat more salmon. This recipe motivates me to do so! i can also think of so many other foods I could slather that dill butter on! Thanks Tahny! It is one of my favorite “go to” weeknight recipes. And the dill butter is delicious on just about anything. Thanks for stopping by! This looks phenomenal! We love salmon, and have it at least once a week but I have my two “go to” recipes for it, so I don’t venture out much, but I definitely have to try this! I made this last night using red salmon and this was fabulous. I live in Alaska and we fish reds and silver’s. Reds are used for cooking and silver’s are used for canning. I’m curious as to what salmon the people in the lower 48 purchase.Thank you for this recipe. You are so lucky to live in Alaska where you have access to so many fresh, wild caught fish! Here in California, I get my salmon at Costco. I buy the frozen Wild Alaskan Salmon. I try to never buy farm raised, it’s worth the extra money to me to get the wild. I’m not sure if it’s red or silver though. Didn’t know there were different kinds! And so glad you liked the recipe Gisela! Thanks for letting me know! I made this for dinner tonight on the fly and it was amazing. My toddler even took a couple bites! *gasp* I paired it with roasted roots, squash, and Brussels sprouts. Thank you!